Website speed directly influences the success of your Joomla website. Every visitors expect a site to load fast and they are likely to abandon a site that doesn’t get loaded in 3 seconds. That means page load time has a critical impact on the performance of your Joomla website. By default, Joomla isn't slow but you can optimize it to achieve great speed. In this Joomla tutorial, I have put together some essential actions you can take to speed up Joomla to improve Joomla site performance to ensure a good experience for your visitors. These tools provide an overall status of your site and tips what can be optimized. Besides securing your Joomla site, having the latest version of Joomla and its extensions are very important for the speed your Joomla website. In each version, there are some code improvements to perform better than the previous ones even if the changes are small. Every new extension installed is taking some resources. Usually, these includes some additional CSS and JS files loaded into the head section of your template which may increase the overall size of the website. Best practice is to keep only those extensions which are required. If you often install new extensions for the test purpose, remember to uninstall them if you do not use them. Caching is a system to store all or part of a web page so that it doesn't have to be pulled content from the database. Though there are many ways to speed up a site, but leveraging caching can be a huge performance saver. The first 2 types are determined by one setting in your Global Configuration. 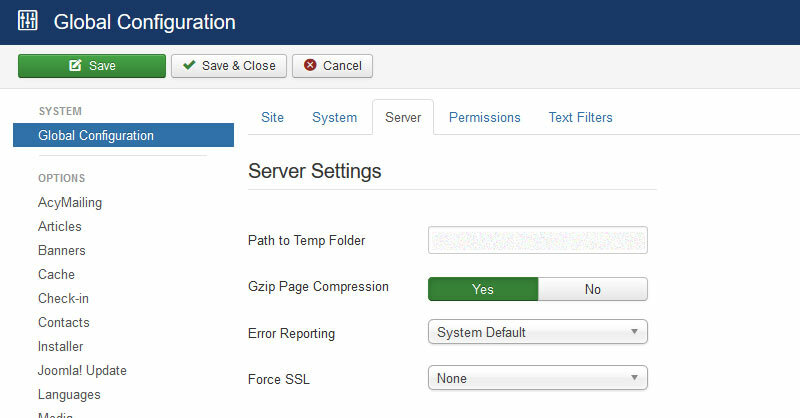 From top menu navigate to "System › Global Configuration" then open the "System" tab and look for the "Cache Settings" section, next select your option Conservative Caching or Progressive Caching. Which caching option to select? Conservative caching (Recommended): Site administrator can choose each module and enable them individually. Conservative caching is better for frequently updated sites - you can remove caching from your modules that contain dynamic content. Progressive caching: Takes a snapshot of each unique set of modules on a page, so modules can be cached at once. This affects all modules and overrides any cache settings inside individual modules. Progressive caching is better for sites that don't update very often. Optionally we can also set the cache time, different than the default of 15 minutes. If globally, cache is switched on, you can switch it off again for specific modules from the Advanced tab in selected modules. Warning: You should enable module cache for modules with static content only and then it works well with conservative caching. Modules with dynamic content should not be cached. Find below some popular 3rd party Joomla caching extensions you might want to try. Compression is another useful feature to improve the performance of your website. The option compresses your pages in a zip-file, transferred to visitors, and unpack there before visible on the browser. This reduces web page size and makes the pages to load faster. To enable the option, go to "System › Global configuration › Server › Server Settings", look for the option "GZIP Page Compression" then enable it. You can use free online tools for testing the Gzip compression on your site such as check GZIP compression. Image play a big role in the success of a site, a nice image can improve content but at the same time, it is also a reason to make your site loading slow. On average 50 percent of a website’s page weight is made up of images. So optimizing images on your website can drastically decrease page load time and speed up Joomla. Unfortunately, in Joomla, there is no built-in option for image compression. You can either compress and resize (optimize the images for web) them before uploading using any image editing tool (like Adobe Photoshop, Smush.it, TinyPNG.com), or use a Joomla extensions like Easy Image Resizer (EIR) which is highly recommended for image compression. Most CDN solutions are paid, there are a few free options available and all will make your pages load faster for a better end user experiences. It may sound complicated, but it is quite easy to implement, and not even that expensive. CDN for Joomla! by Regular Labs (NoNumber) is an excellent option. It is available in both free or paid (30 Euro) version, works with all of the major CDN providers, and has all the flexibility you need. JBetolo: It is similar to JCH-Optimize, in addition offers CDN-support, .htaccess tuning, and even Smush.it support. 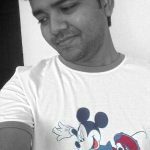 ScriptMerge: Another solution that is worth to mention. The usual CSS and JS compression / combining capabilities. There are also many other features that you may want to test on your site. You can further optimize your web page loading time by enabling browser caching from the page cache plugin. This tells the browser whether a file should request from the server or grab it from the browser’s cache. To enable the plugin go to Extensions › Plugin Manager › System Page Cache. You can then enable "Use Browser Caching". Make sure you click the "Save button" to complete the changes. you can add some HTACCESS codes which tells your browser not to request specific image types from the server if they are already present on visitor PC. This saves a lot of bandwidth. If you are running on Apache server you can download and put the codes to your .htaccess file. Even if your website loads fast on any desktop, it may not perform very well on a mobile device. The key to improving this is to only load what is really needed. The NoNumber Advanced Module Manager is a tool that can be used to implement this. Optimizing your MySQL database can help to reduce loading time. You can do this manually from PHPMyAdmin or just use a plugin. Finally, as you can see there are many ways you can optimize the speed up your Joomla site. However, a site is never fast enough; it's a continuous process of making improvements in the right places. If you have finished all the above optimization tips, it is the time to check the new result on Google PageSpeed Insights. Hopefully, your site is much quicker than before. I hope you found this Joomla optimization tip helpful. In my other Joomla tutorial, I've shared some Joomla Security Checklist Best Practices to protect your Joomla site from hackers, hope you will find that useful too. Thanks for explaining everything in details, well-written article and to the point.